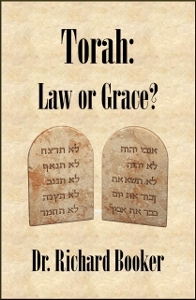 Home > Hebraic Roots Books > Torah: Law or Grace? Are You Under Law Or Grace? Torah: Law or Grace? could be one of the most eye-opening books you will ever read. In these brief pages, you will discover how Western Christianity misinterpreted a most fundamental teaching in the Bible. This is the teaching on law and grace. This book explains how these powerful words have been misunderstood, the prophetic restoration of their true meaning, and the significance this has for your life. "I enjoyed very much reading your valuable manuscript on Torah: Law and Grace. Many wonderful insights, a very useful tool. Thank you for the balance with which you present things." Marvin R. Wilson Ph. "Richard has provided a quick, easy-to-read assessment of the common problems addressed around the mistaken idea that law opposes grace." Ron Moseley Ph. D.
In this revolutionary book, best selling author and Bible teacher, Dr. Richard Booker clarifies the meaning of law and grace, how they relate to the Messiah and the practical application for our lives today.